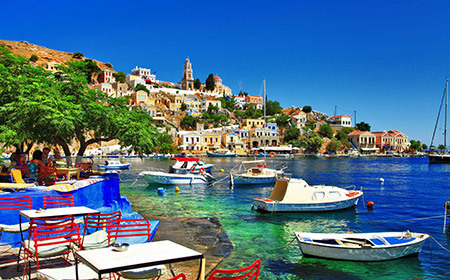 The beautiful Greek island of Symi boasts one of the most photographed harbours in the world. And as you sail into its welcoming embrace you will understand why. The harbor is naturally horse shoe shaped with the hillside around covered in identical houses, neo classical and painted in every shade of pastel. Time seems to have stood still. The quayside is lined with fish tavernas, spice stalls and shops selling natural sea sponges. The sponge diving industry was the islands main source of income for many years and most of the shops have a story to tell about this hazardous occupation. The rest of the island is barren, testament to its ship building legacy. The legendary ‘Argo’ was built here, the ship that carried Jason and the Argonauts to retrieve the Golden Fleece. You have plenty off time to explore the peaceful streets leading up and off from the hustle of the quayside or climb up to either of the magnificent churches. Or can enjoy the atmosphere from a harbor side café and take in that view! The boat will also call in at the Monastery of Panormitis which is on the other side of the island. This is a working monastery and in the church is a revered icon of the Archangel Michael. The harbor of Panormitis is a literal ‘port in a storm’ and has saved the lives of many. There is a small museum behind the church which is worth perusing for some fascinating tales.